Precise and error-free publishing is difficult without any professional lectorship. Each person who phrases, i. e. formulates, a text which is supposed to be published has to meticulously mind that no mistakes are to be found inside the text. Most of the time the problem is that the author of the text him- or herself does not see some mistakes made, the reader, however, notices them more often than not right away. Only rarely the reader will excuse mistakes and inconsistencies made by the author, they are more often than not negatively looked upon, the author is seen as not being able to speak the language, scatterbrained or labelled as being too much in a hurry. However, this should never happen. That is why it is important that every text is being proofread before its publishing. AllboutEnglish can be of assistance here. We deal with the text in an unbiased fashion and are capable to detect any mistakes and inconsistencies. Finding of conceptual design represents one further item in our list of duties with respect to lectorship next to proofreading, holding contact and attending to clients/ customers. Very often we are not familiar with the development of a text, it is completely new to us. It is exactly this that ensures a closer reading, which – in turn – simplifies the finding of mistakes. 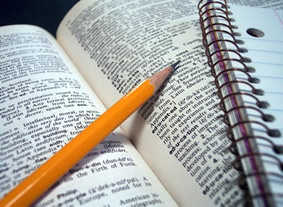 We edit and proofread the given texts with high precision and accuracy. We do not only look at correct grammar and orthography, we also pay attention to correct punctuation, form and stylistics. Finally, we thereby develop a text that represents one unity, which is linguistically as well as textually correct and, thereby, moves the author of the text into a positive light. As a professional service provider AllboutEnglish also strongly participates in finding and editing new ideas and projects of/ for publications. Our meticulousness adds to the fact that correct printed editions can be published. Agencies, editorial desks and other places that are looking for lectors/ correctors in Germany to fulfill a special job will find adequate professional service providers at/ in AllboutEnglish.